These pages are designed to expand on those guidelines to give staff and students additional support and guidance on the ethical use of animals in research. You will find links to useful information resources held on external web sites and to further university guidance. The University is committed to ensure that the highest ethical standards and standards of care and respect for animal welfare are being maintained in all research where the use of animals is essential. Alternative methods to the use of animals are under constant development and animal procedures will be replaced with non-animal techniques wherever possible. Replacement – to use alternatives wherever possible, for example, computer modelling, cell and molecular biology, tissue culture, human clinical research. Only when the AWERB is fully satisfied that these principles are being adhered to will proposals be approved and, where a licence is required, submitted to the Home Office for its approval. Highly experienced and qualified veterinary and animal care staff are actively involved in the ethical review and scrutiny of research, the welfare, care and husbandry of animals and provide advice and support to all staff and students involved in research using animals. There are different processes for the approval of animal work depending on whether the work is covered by the Animals Scientific Procedure Act 1986. Please use the flowchart to help you identify which process your project will follow. 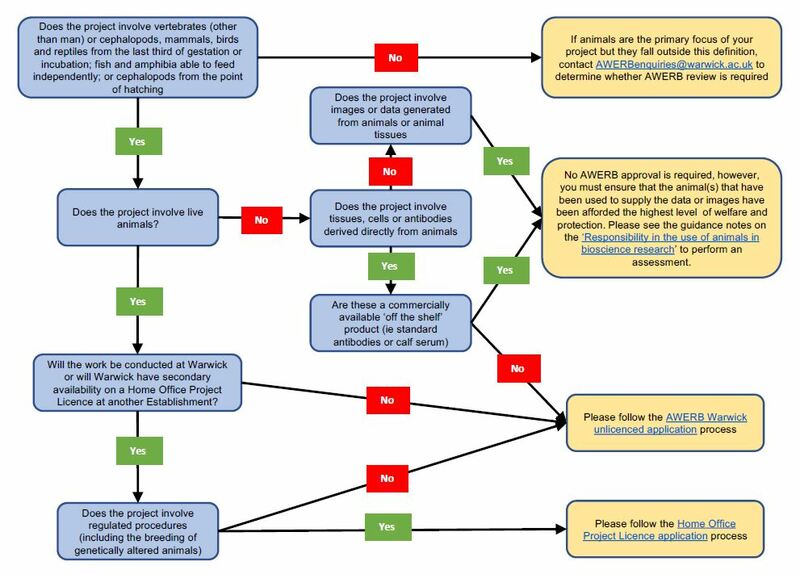 To view the flowchart with live hyperlinks please open / download 'Guidance on the ethical use of animals, their tissues or data in research issued by the University of Warwick Animal Welfare and Ethical Review Body (AWERB)'. Please see the University’s Research Governance & Ethics and Research Code of Practice websites for more information. Please use your University email account when using that email address as emails from non university addresses will not be read. The University endorses the NC3Rs ARRIVE Guidelines for the reporting of research using animals.